​​A subsidiary of Japan-based Mitsui O.S.K. Lines Ltd., TraPac completed the final phase of its five-year, $460.7 million Port infrastructure program. The Port received $62.9 million in grants for this project. The final phase of construction included a new maintenance building, and on-dock rail and backland improvements. These are in addition to previously completed construction, which included extending the wharves to 4,600 linear feet, deepening water depth at Berths 144-147, installing new cranes, a pedestrian bridge, Alternative Maritime Power (AMP®), and constructing road and gate improvements, as well as terminal buildings. Trapac has invested over $180.0 million in automated equipment. Completion of the project makes the Port home to the first automated terminal/rail facility on the West Coast. Yang Ming, a Taiwanese marine transport company that operates at the West Basin Container Terminal at Berths 121-131, Yang Ming plans to enhance its terminal facilities and deepen its berths to accommodate 14,000 TEU vessels and increase cargo volume. The environmental review process for the proposed berth improvement project by Yang Ming is expected to conclude in November 2018. As part of the project, the Port plans improvements at the terminal that will include construction of a new 1,260 linear-foot wharf at Berths 126-129, dredging to a depth of -53 feet at the newly constructed wharf, and expansion of the existing on-dock rail yard. 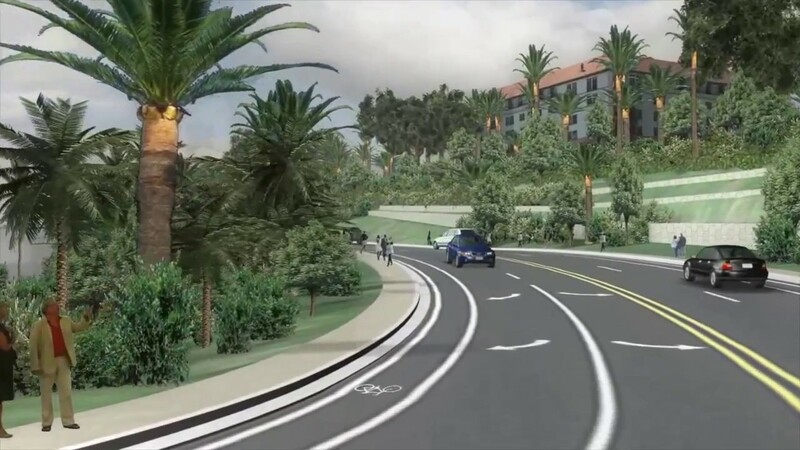 The Harbor Boulevard Roadway Improvement project will wrap up its third and final phase of construction in the summer of 2018. The reconfigured three-way intersection at Harbor Boulevard and Sampson Way in San Pedro will provide improved road and pedestrian access to the San Pedro Public Market when the new attraction is built. The third phase of construction included modifications that rerouted current traffic flow along Harbor Boulevard to the new three-way intersection along Harbor Boulevard at Sampson Way. 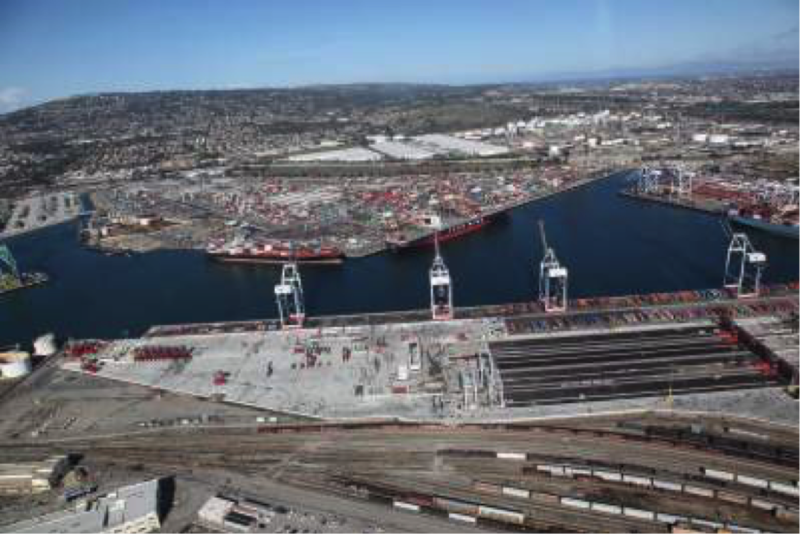 Of the total project cost of $14.8 million, $5.9 million was funded through a grant from the Los Angeles County Metropolitan Transportation Authority with the remainder paid for by the Port. 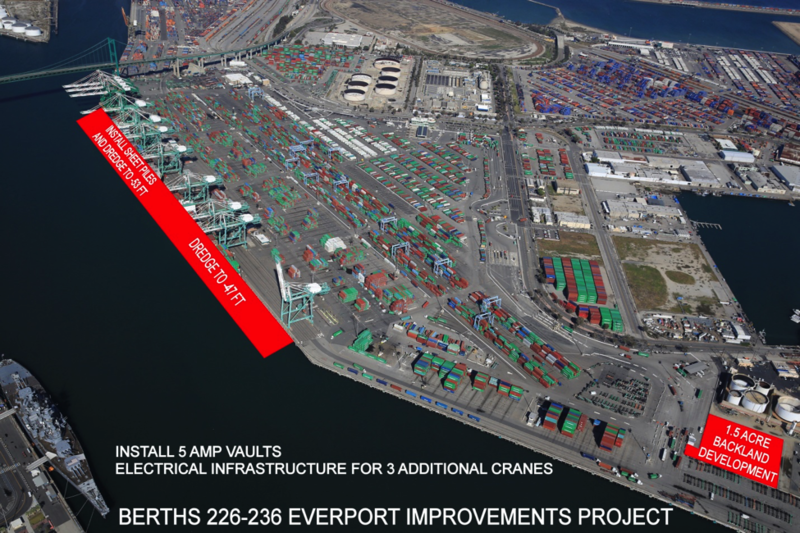 In October 2018, the Board certified the Final Environmental Impact Report (EIR) for Everport’s adopted $67.0 million improvement project for Berths 226-236. Design work is in progress on proposed improvements to ready the terminal for 14,000 TEU vessels. Improvements include wharf upgrades at Berths 226-229 and Berths 230-232, and new berth depth increases to -53 feet and -47 feet respectively. The project will also involve constructing an additional 1.5 acres of backland and electrical improvements for additional cranes and five new AMP® connections. Construction is expected to start in early 2019. 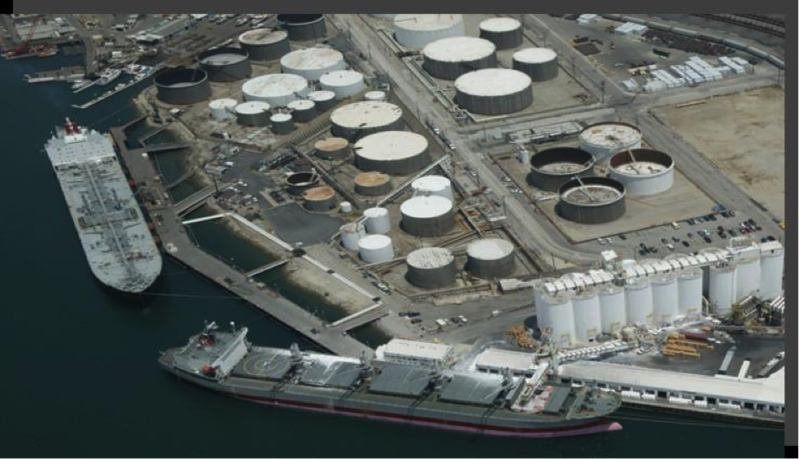 In March 2018, the Port released a Draft Environmental Impact Report (EIR) for Shell Oil Company’s marine oil terminal located at Berths 167-169 in Wilmington. A meeting was held in April to solicit public comment. The adopted $22.5 million project is needed for the terminal to comply with the Marine Oil Terminal Engineering and Maintenance Standards (MOTEMS) building standards that apply to all marine oil terminals in California. In July 2016, a Notice of Preparation (NOP)–the first step in the EIR process–was issued for the Valero terminal on Mormon Island for similar compliance work totaling $26.7 million. A Mitigated Negative Declaration was considered by the Board in May 2018 for a new marine oil platform for PBF Energy at Berth 238. The primary goal of this $25.7 million PBF Energy project is MOTEMS compliance. The Port held a town hall meeting in March 2018 to provide the community with updates on the planned San Pedro Public Market as well as other LA Waterfront projects and programs. The 40 acre redevelopment project will include restaurants, entertainment venues, shopping, fresh markets, office space, and a waterfront promenade with ample outdoor space and an open-air amphitheater for live entertainment. The Project developer, San Pedro Public Market LLC (the Ratkovich Company and Jerico Development), also presented updated design renderings at the March meeting. Demolition of the existing structures on the former Ports O’Call site continued in March with the demolition of all structures between the San Pedro Fish Market and the Ports O’Call restaurant. Total project cost is expected to be $152.0 million, with $100.0 million paid by the developer and $52.0 million to be funded directly by the Port. Port improvements will include a 30-ft wide promenade along the water’s edge, town square improvements, and 600 linear feet of floating dock for public/visiting vessels. The San Pedro Public Market is expected to open in 2021.